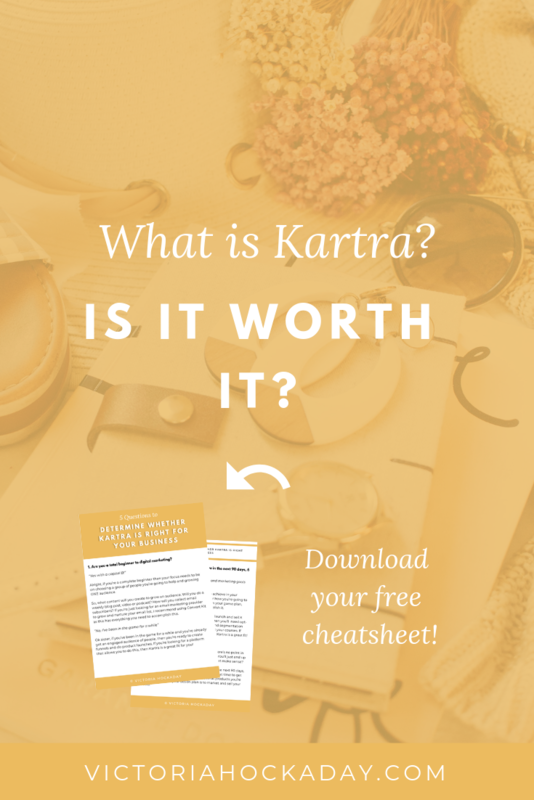 What Is Kartra and Is It Worth It? If you’ve been hearing the buzz online about Kartra, you’ll know that it’s coming up as a major competitor against Clickfunnels, Kajabi, Infusionsoft and Leadpages. So, if you’re currently researching Kartra to find out whether it’s worth it, you’re in the perfect place! 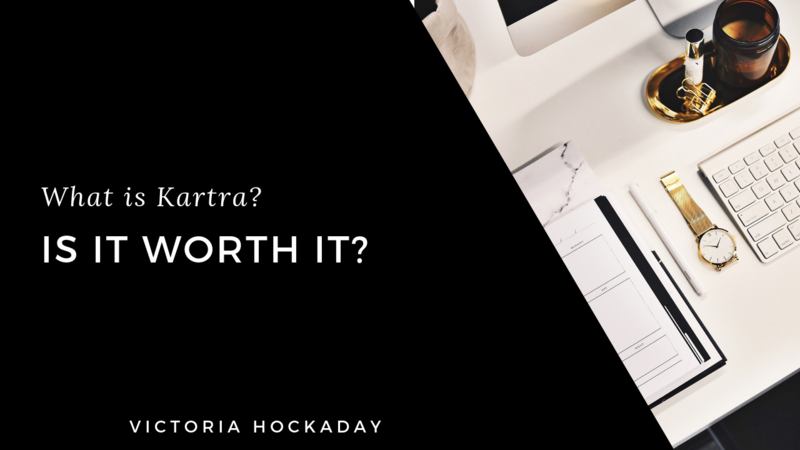 In this post, I’m going to give you the insider details on Kartra so that you can decide whether it’s the best fit for you. Most importantly, I’m going to help you decide whether it’s right for your business based on a number of factors. Are you excited? Let’s go! 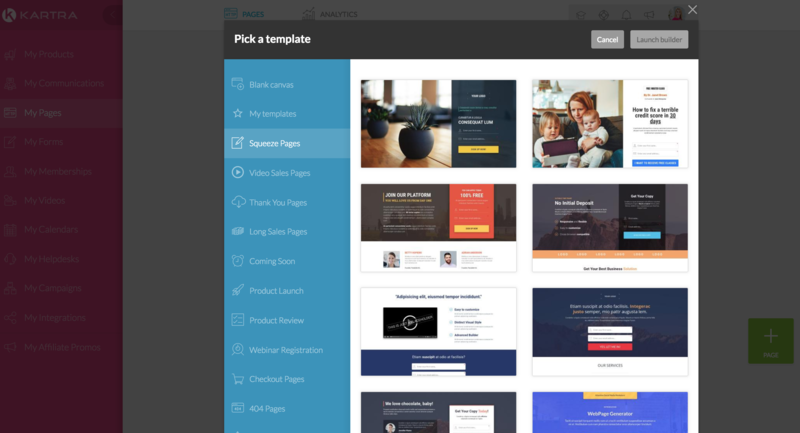 Kartra is a page builder, sales funnel builder and marketing automation platform. It differs to other platforms because it takes the ‘whole-package approach’. 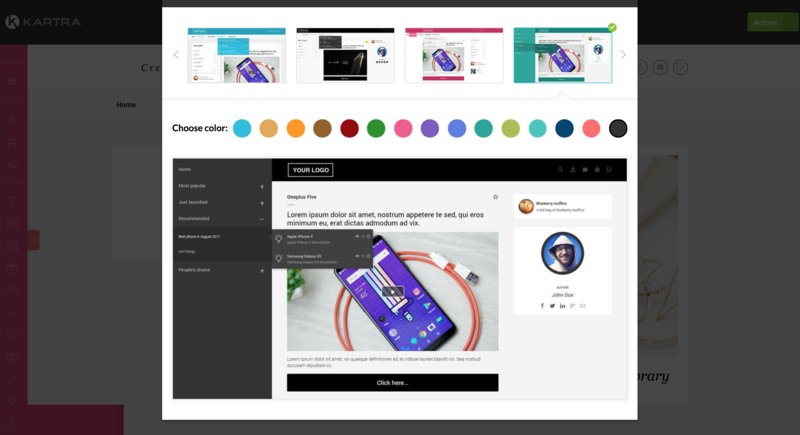 Basically, it’s an all-in-one business platform that consolidates your landing pages, sales pages, online courses, membership sites, email system and payments in one place. So, instead of having to switch between several platforms that serve different functions, you can have one home for your online business. Pretty sweet right? You get to visually see the customer journey from the point of entry to moving through funnels, email sequences, to signing up to your products and memberships. It’s easier to track your marketing goals because all of your systems, such as opt in forms, landing pages, courses, videos and payments are in one place. If you’re a newbie or you don’t have an active email list, you’ll struggle to monetize and you’ll end up wasting money. I’ve seen it first-hand people investing in Kartra when they don’t have an active email list or game plan for how they’re going to use Kartra to make sales. That’s why, if you don’t have a clear strategy to sell your products or you don’t have an active audience of people to sell to, I recommend that you focus on growing your audience first. The more engaged your email list and the bigger in size, the more monetary success you will have later on when you decide to launch your digital products. If you think about it, Kartra is built in mind for business owners who want to build sales funnels to launch digital products and host their digital products. So, if you’ve not got an engaged email list of 2,500 email subscribers, I recommend holding off from signing up to Kartra. The reality is, you don’t need Kartra to grow and nurture your email list. You just need a tool that does the basics, such as collecting email addresses and the ability to nurture your list with email sequences and newsletters. That’s why, I recommend Convert Kit. It allows you to create opt-in forms on your site so that you can collect email addresses. 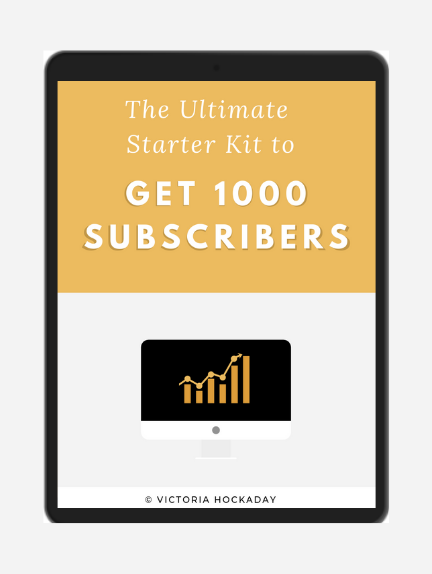 Plus, you can create email sequences and newsletters to nurture your email list. Alright…I think I’ve stressed enough the importance of having an active email list before signing up to Kartra. I hope you can tell that I’m saying this because I have your best interest! But, if you’ve already got this down, Kartra is going to be a better fit for you! Here’s some of the features inside Kartra. What Features Are Included In Kartra? Kartra’s funnel builder let’s you build sales funnels by dragging and dropping objects to a canvas. This allows you to create sales funnels and it’s fairly intuitive and easy. To create a sales funnel you would create a starting rule for your sequence, for example, this could be someone filling out a form. Next, you would add an email object and configure the day it’s sent, who it’s from etc. Then you’d add the content to your communication. Here you have two options, you can choose between basic or advanced. This comes in handy if you’re doing a product launch and you’re going to be using features, such as images, testimonials, videos, call to actions and countdowns. After you’ve created your steps, you need to connect it to the other steps in the funnel until a yellow arrow is shown. Then you need to activate your step so that it goes live when you publish it. It’s easy to create a sales funnel with the drag and drop function, so you can set up a funnel fairly quickly. You can visually see the flow of your funnels so you can see the bigger picture of your customers’ journey. You can do split tests to optimise your open rates and conversions. This comes in handy if you want to test different headlines and email text. Kartra also gives you the option to set a percentage on this. For example, you can split test a variable such as your headline for the first 100 people and then based on that result you can edit your headline. You can leverage advanced features for your product launches, such as testimonials, call to actions, countdown timers, videos and testimonials. You have the option to “split” your emails. For example, if you’re sending out a few freebies, instead of your audience receiving a few sequences from you, alternatively you can create a “split” after a welcome email. As a result, people who opt in to receive a few of your lead magnets, would only receive one sequence from you. Every step in your funnel generates metrics for open rates, click rates and the amount of income generated. This comes in handy when you want to see which emails brought in the most sales. If you’re a beginner at funnel building, it isn’t super clear that you need to link steps with the yellow arrow as there aren’t instructions or tips shown on the page. (I know this as I’ve seen many people get stuck on this). However, once you learn this, you get the hang of it. Another key feature that Kartra offers is email marketing. Inside Kartra you can create email campaigns and email broadcasts pretty easily. Broadcasts are one-time emails that you send out to your email list, for example this might be a one-time offer or a weekly newsletter. Kartra’s email builder is intuitive and it makes it easy to create a custom email with components like header images, testimonials, buttons, videos and call to actions etc. Here’s a glimpse of what creating an email broadcast looks like. You can easily save them email templates so that you have a consistent look and feel. So, you can have your emails created and sent out quickly. It’s easy to customise your emails with custom headers, images and fonts so that you can give personality to your communications. Ability to organise your broadcasts with categories. This comes in handy when you want to duplicate emails, reuse promo emails, repurpose content or get inspiration! Segment your email list so that people receive tailored communications based on their behaviour. For example, whether they subscribed to your list, filled out a form, purchased an offer or didn’t purchase an offer). Kartra gives you recommendations on the best times to email your list based on open rates and (CTR) Click Through Rates. Probably one of the biggest downsides of email marketing that I’ve seen people discuss is the branding. For most email providers, you can remove the branding, especially when you’re paying for the service. However, Kartra has its logo on the bottom of each email. Now, this might be a deal breaker for some people because it suggests that Kartra puts it’s own brand before the needs of their customers. I said I’d be honest didn’t I? Another core feature that Kartra has is landing pages. Kartra’s landing pages are organised by categories so you can organise your pages into various categories. This comes in handy when you want to quickly find a page to edit it or clone it. I’ve duplicated my pages a few times and it’s so much quicker! Kartra has a ton of stunning high-converting pages, so you can choose a page and easily customise it. 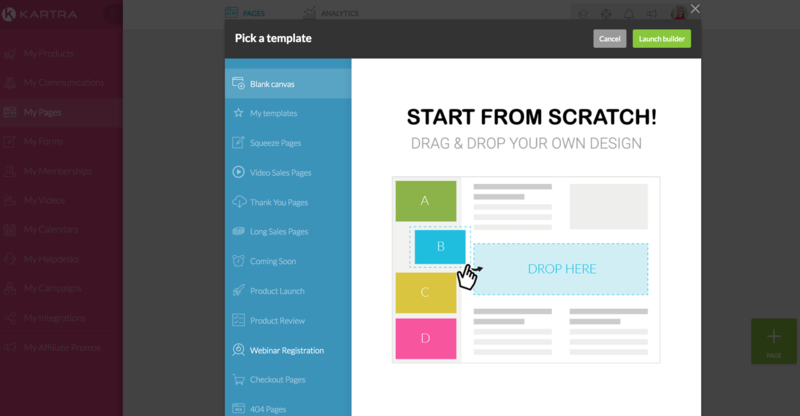 Once you’ve started to create your own landing pages you can save them as templates. Again, this means that you can build a page and get it up and running fairly quickly. 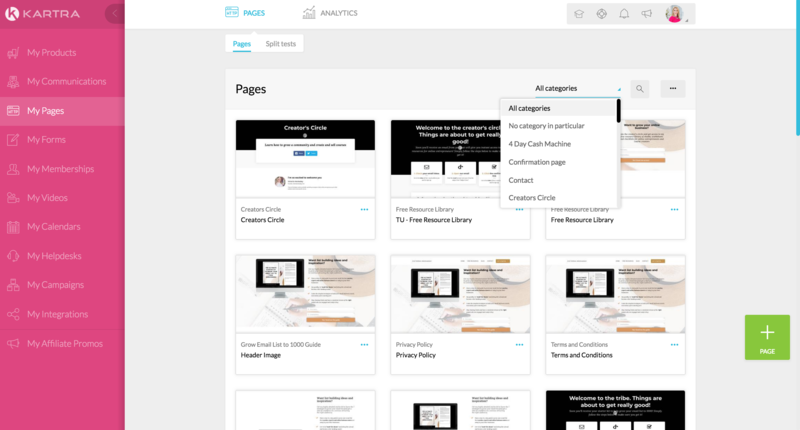 The page builder is easy to use and intuitive. So, you can build a page, give it a name, publish it and get a page up and running fairly quickly. 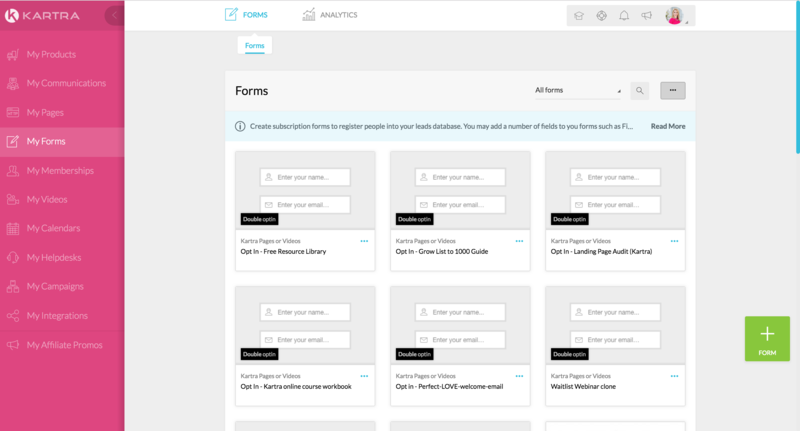 It’s easy to drag and drop components onto your page, such as opt in forms and call to actions. You can embed videos onto your page using Vimeo, YouTube or Kartra. Kartra video comes in handy when you’re doing a launch and you want to see at what point did they leave the video or at what point did they purchase during the video. It’s easy to create a sales page and link it to a checkout page. This is far better when you have your sales page and checkout pages in one place. As opposed to having to link your leadpages with Sam Cart. What a drag! In the settings, you can easily add SEO or a tracking code if you’re running Facebook ads. 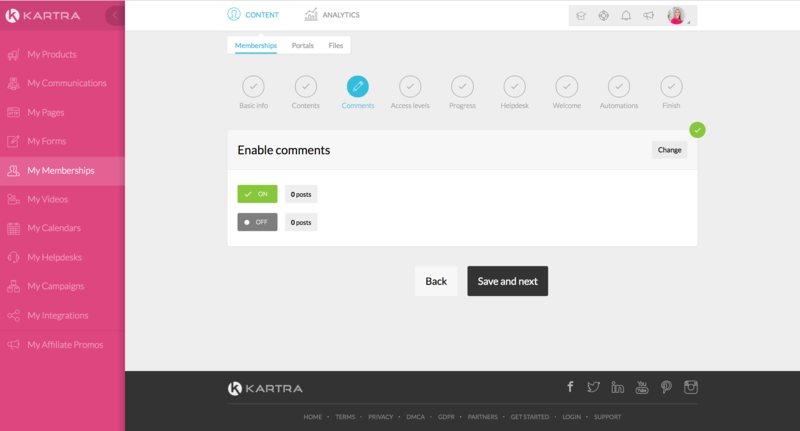 Unlike other tools, Kartra doesn’t automatically save your content. This can be irritating if your browser disconnects and you lose your content. To prevent this make sure you click save progress when you’ve built your page. It’s easy to create a page, save your progress, visit the link only to see it showing a previous version of your page. Make sure you click ‘publish’ after each revision so you see the latest version of your page. It isn’t clear what your font or line height is in your text because Kartra doesn’t label it for you. So, to make sure that it is consistent throughout the page, keep a note of it or duplicate text elements. Each time you create a page with Kartra, you need to create a form and go through a series of steps before your form is completed. For example, if you are creating a landing page for your opt in then you’ll need a thank you page, landing page, a form, a list etc. As a result, you can end up doing everything at once and it can feel overwhelming. To give Kartra a whirl for $1 for 14 days, simply click here or the image below. If you’re looking for a platform that has products and payment functionality, Kartra is perfect for you! In Kartra, you can create a range of products to suit any product type, such as ebooks, online courses and done for you services. Each time you create a product, you’ll need to go through various steps before it’s up and running. First, you’ll need to name your product and then configure payment processing. You can easily set up payment processing and you have a few options such as Paypal, Stripe, or credit card. Next, you can set product pricing. You can set payment options like one time payment, recurring payment or limited number of instalments. These options come in handy for when you do product launches! You can also have an initial payment so people get a taste of your product e.g., $10 for the first 30 days. Recurring payments are great if you have a membership platform. You can also set sales tax and create a refund policy. If you have different price points you can create customised pages. For example, if your offer includes a 1:1 session, after someone purchase this, you can add a ‘Book a Call’ call to action on your thank you page. To do this, you just go to your product > contents > The Thank-You Page and for each price point select the thank you page. Or, if you someone purchases your VIP membership, you might give them access to a different community. Again, you’d have a different price point for this and you’d link it to a thank you page with a link to access the community. Pretty sweet, huh? You can set payment options like one time payment, recurring payment or limited number of instalments. Pretty useful for when you’re doing a launch and want to offer multiple pricing options! It’s easy to customise how people access your product, for example, through a Kartra membership, custom link or downloadable file. You can create tags and send specific communications to those tags. For example, you might create a tag called “abandoned cart”, so if someone viewed a page but didn’t purchase they will receive a sequence of emails. This gives you a great opportunity to address objections people might have towards buying your offer. Again, this is amazing for when you’re launching a digital product! The downside of products is that when you create a product, you have to go through several steps before you can edit it. If you’re looking for a platform to deliver your courses and memberships, Kartra is a great fit fot you. Kartra has a membership portal management system to deliver your courses and memberships. It makes it fairly easy to deliver your content to your members and manage how they receive your content. 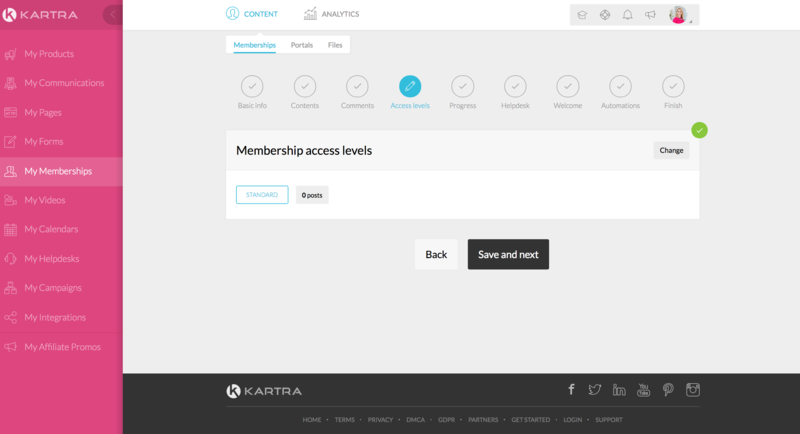 When you create a membership in Kartra you have two options on how people can access it. You can give them full access to your content or you can drip one module at a time to your members using Kartra’s automation features. To set up a membership in Kartra, simply go to my memberships and Kartra will take you through a series of steps until your membership is up and running. Once you’ve gone through those steps, you can go to the ‘membership builder’ to add content to your membership. Very similar to the other features in Kartra, you drag and drop elements to a blank canvas. To begin building your membership, you need to create a post. To do this, go to the banner on the left and under ‘post contents’ drag an element, such as a header or text box. Next, keep adding different content elements that you need to deliver your content. After you’ve added all the elements to a post, you can add your host bio. To do this, simply go to the banner on the left and where it says ‘sidebar contents, drag and drop host into your sidebar area. Finally, if you want to create separate modules for your membership you can do this using categories. To do this, simply go to ‘new category’ and drag it into the canvas. Next, you’ll need to label the title of your module. Once you’ve created your membership, you can change the structure of it so your modules appear on the left. To do this, you can go to preview and select a style and colour for your membership. Kartra gives you plenty of content styles using the drag and drop feature such as text, headers, audio playlists and video etc. This is great if you want to give your audience an immersive experience. You can organise your courses into modules using the categories in the sidebar and you can change where these categories are displayed. The portals give you a chance to showcase your courses that you have. This is great for up-selling because if one person purchased an offer and they got value from it, they’re likely to purchase your other courses. As you might already notice, the membership builder doesn’t have as many customisation features as the page builder. For example, there is a limited amount of font styles to choose from. 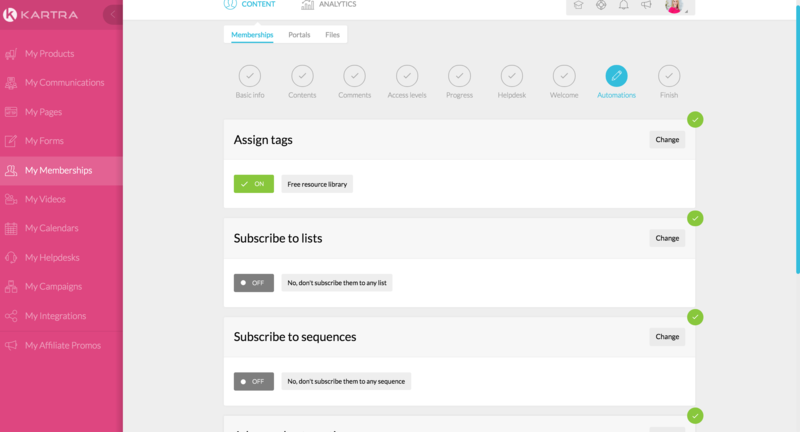 So, Kartra still has a long way until it’s a fully customisable learning management system. Finally, one of the best features in Kartra is the integrated analytics. Essentially, you have a complete track of your customer’s journey from the point of entry through funnels, email sequences, membership and products. Pretty sweet, huh? Kartra has a dashboard where you can view and measure key metrics, such as sales, subscriptions, traffic and conversions. So, it makes it really easy to check-in and keep track of your traffic, list growth and sales. Above that, Kartra has analytics for most of your features, such as open rates, click through rates, video views and sales. This takes the guesswork out of your business and allows you to make informed business decisions based on data. 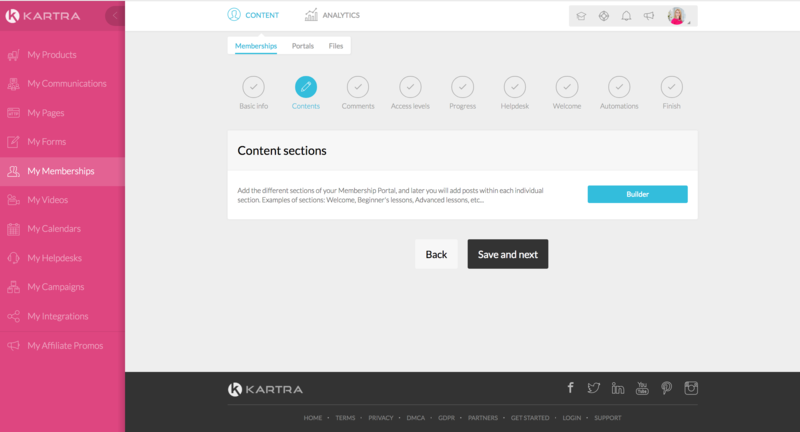 So, Kartra has got some super cool features but will it help you achieve your marketing goals? 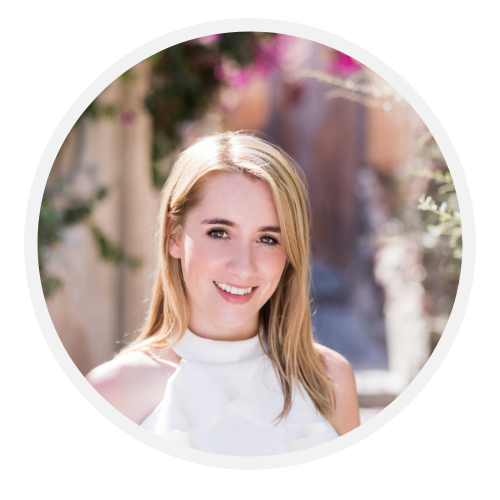 Will Kartra Help Me Achieve My Marketing Goals? If you’re an online business owner and you want to sell passive income products then you probably have 3 goals. 1) generate leads, 2) sell digital products and 3) increase conversions. So, let’s discuss how Kartra can help you achieve this! Before you create passive income products, you need to have a sufficient and engaged email list that you nurture consistently. If you’ve already got an active and engaged email list, then you’re probably thinking will Kartra help you continue to generate leads. Kartra can help you generate leads in a number of ways. Once you’ve signed up to Kartra you get access to several done for you campaigns. One of these campaigns is the list building funnel. It’s worthwhile starting off with this campaign as it will populate everything as a template to get you started faster. Meaning, you’ll have a list building funnel up and running quickly so that you can up-level your list-building game and generate leads every single day. Kartra has expertly designed landing pages that are proven to convert in the online marketing space. So, that gives you a head start because you know that a good offer with Kartra landing pages are going to convert really well. If you want to optimise your lead generation strategy, it’s worth adding 7 opt-in forms on your website. Have you ever heard the rule of seven? Basically, it takes someone on average 7 times before they take action. This rule also applies to how you place your opt-in forms on your site. That’s why I recommend that you place your lead magnet as many as 7 times on your site. One of the ways to do this is through pop ups. 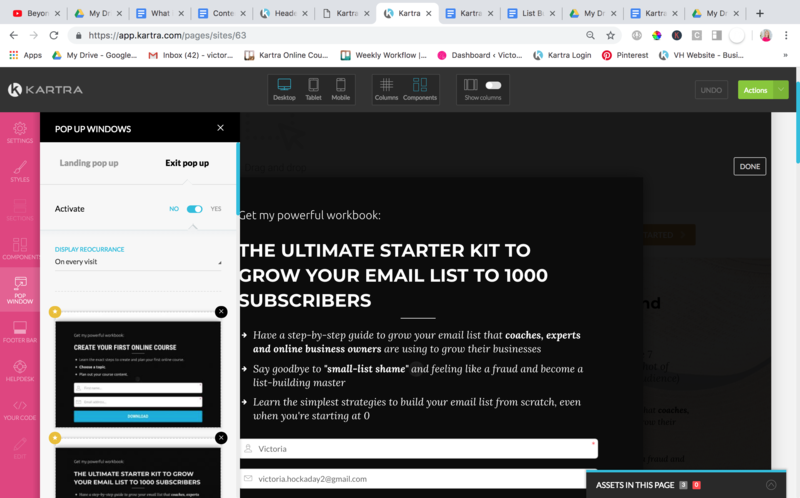 Pop ups are amazing for growing your email list because it gives people another opportunity to sign up to your email list. It’s really easy to create a pop up form in Kartra. Simply, go to the page where you want a pop up appear and click on ‘pop ups’. Kartra will show you a dozen of pop up templates to choose from. This means that you can have a pop up up and running fairly quickly. Kartra also gives settings for your pop up to be activated on the first visit or every visit. Another strategy to generate leads is with high value opt-ins. Once you’ve created a lead magnet for your audience to grow your audience to 2,500 subscribers, you can up-level your lead magnet with a high value opt in, such as a free course or masterclass. The great thing about this is that it showcases your value, delivery style, mission and personality. It creates an immersive experience for your audience to see your value first-hand. As a result, it becomes a no brainer to upgrade to your paid products or courses. Setting this up in Kartra is relatively easy. Simply, create landing page with an opt in form. 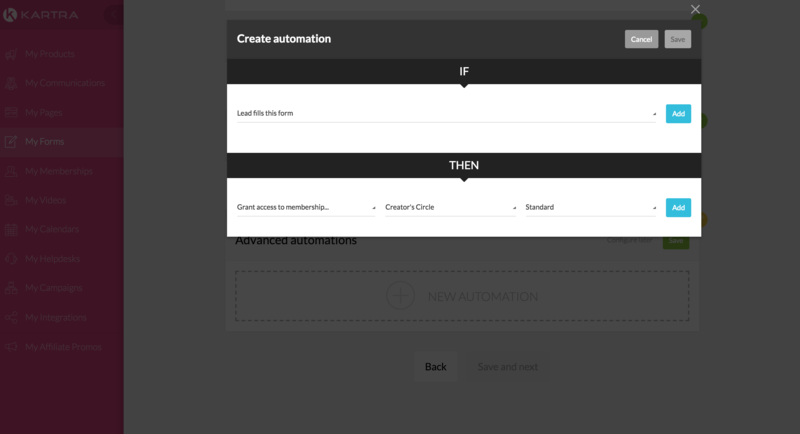 Next, create an automation rule in your form so that people who will in the form get access to your membership. To do this, select IF person subscribers to list X, THEN grant them access to membership site X. You can check out my resource library here. Webinars are incredible if you want to massively grow your email list. They’re amazing for capturing your audience because they humanise your brand and build trust quickly. 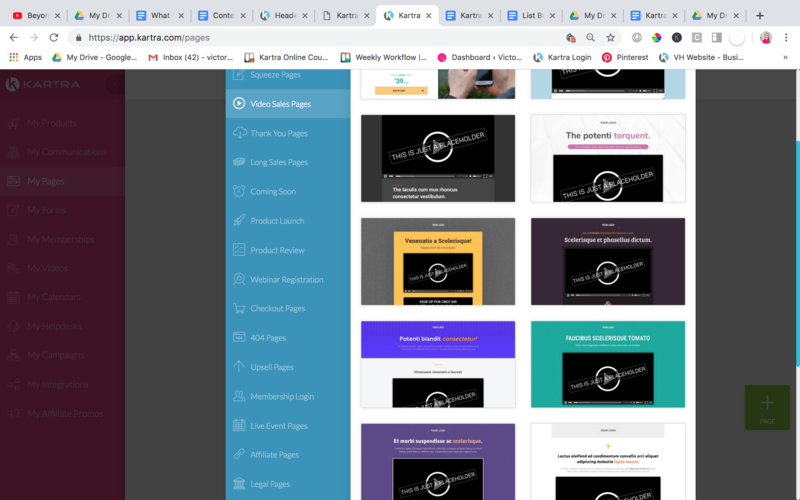 It’s relatively easy to set up a webinar inside Kartra and you have two options.You can either pre-record your webinar and upload the video to Kartra and embed the video into a page. Or you can sign up to a webinar tool such as Webinar Jam and integrate Webinar Jam with Kartra. To do this simply, go to pages, choose a webinar landing page, create a form that links up to a separate email list. Next, upload your video to Kartra, create a new page and embed your pre-recorded webinar on a landing page. Alternatively, you can create a button for people to watch a live Zoom or Google Hangout. 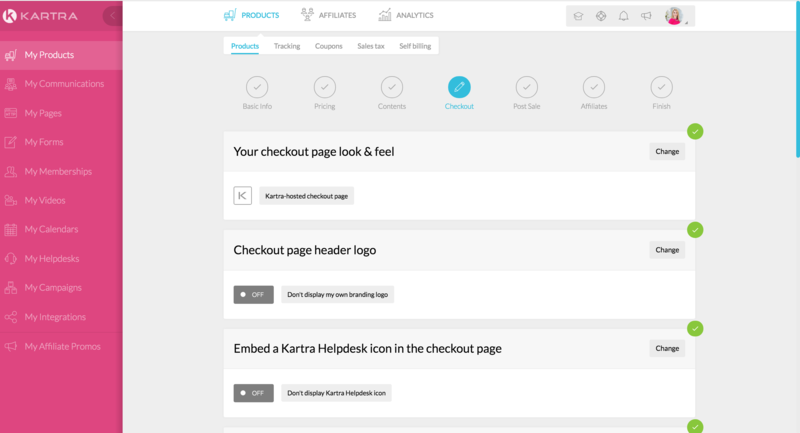 If you’re looking for a platform to sell digital products, Kartra is a fab fit for you! This is where Kartra can help you the most and there’s several features Kartra has created to help you sell your digital products. Kartra gives you a range of pricing options for your digital products, such as one time payment, recurring payment or limited number of instalments. Having different pricing options have been proven to increase conversions, so they’re definitely worth taking advantage of if you want to increase your sales. 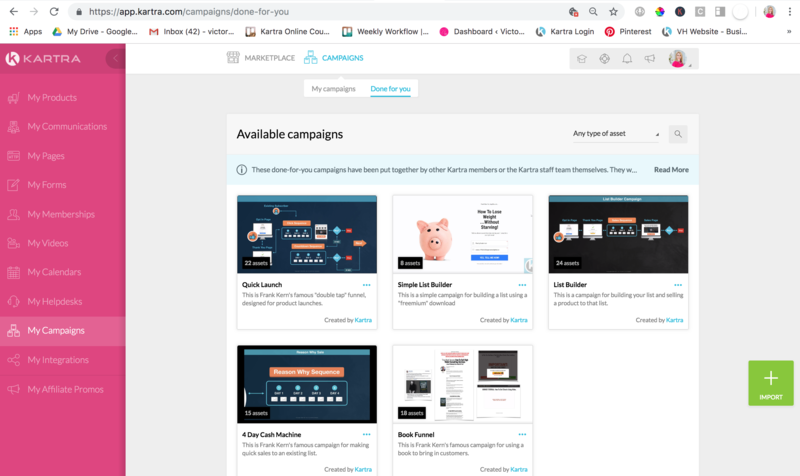 When you sign into Kartra you’ll get access to several done for you campaigns that have been built to help you sell your digital products. If you’ve already got an engaged email list between of 2,500 active email subscribers you can implement campaigns, such as the 4 day cash machine. This campaign is amazing for getting a sales funnel up and running quickly and generating immediate sales for your digital products. To do this in Kartra, it’s pretty easy. Simply go to ‘done for you campaigns’ and click on ‘done for you’. Next, go to 4 Day Cash Machine and click ‘deploy’. Once, you’ve clicked deploy Kartra will take you through a series of steps to implement this campaign. 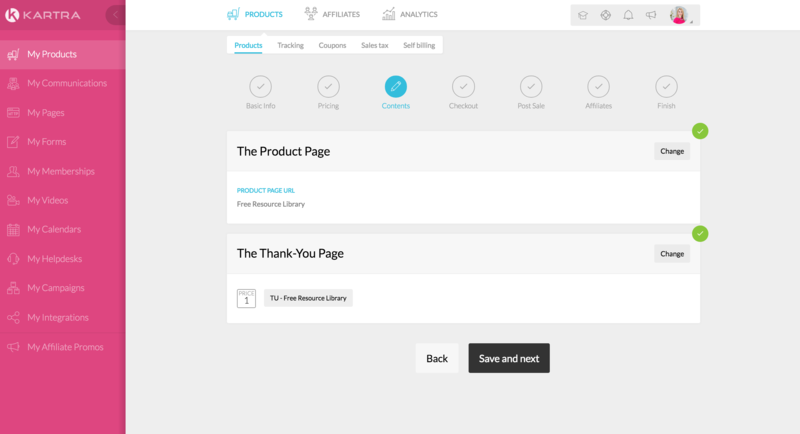 Kartra also has a Quick Launch funnel that you can implement. If you’ve already got several products, you might be looking to find out whether Kartra can help you amplify your profits and increase your conversions. Kartra has a few features so that you can optimise your conversions. One feature that Kartra has which beats other platforms is its tagging and segmentation feature. Basically, after someone has signed up to receive your offer or watch your webinar, you can create separate tags based on how people behave. As a result, you can attach these tags to separate email sequences so that people receive specific email communications from you. This is an amazing tool to optimise your conversions, such as email open rates, click through rates and sales conversions. Meaning that you’ll be able to create intuitive and fine-tuned emails based on how each customer behaves. Kartra also has other features that are proven in the online marketing space to increase sales conversions, such as split testing, call to action buttons, countdown timers, money back guarantees and testimonials. 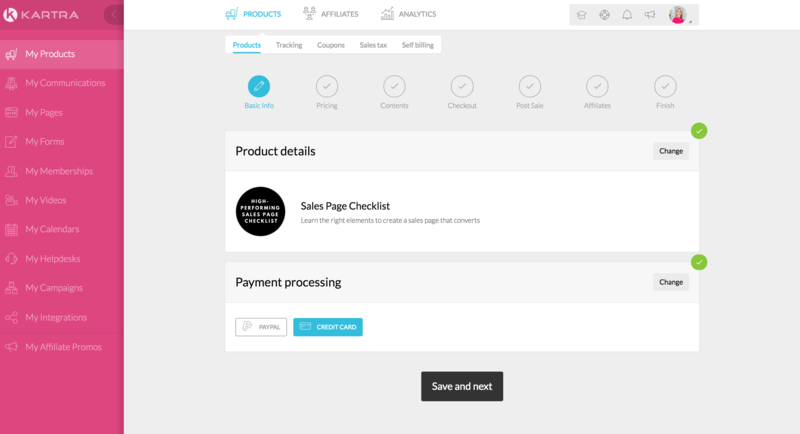 Again these features in Kartra will help you optimise your sales conversions to sell more of your digital products. So, is Kartra worth it? Is it right for your business? My objective answer? It depends…If you’ve already got several products that you’re selling on a similar platform then it’s a no brainer to upgrade to Kartra. It’s likely that you’ve already got funnels that are selling your products on auto-pilot and you’re already spending a hefty amount of money on business tools that build pages, send emails and build funnels. So, it makes perfect sense to switch to Kartra because it will simplify your systems so that you can amplify your profits. The integrated analytics in Kartra allow you to have a complete track of your customer’s journey from the point of entry to, funnels, email sequences, memberships and products. So, you can use these metrics and do A/B testing to optimise your conversions. Alternatively, if you’re a beginner with a capital B and you don’t have an engaged audience of people, you’re better off focusing on growing and nurturing your audience. Without an engaged email list, there’s no point in investing in a platform like Kartra. Kartra is built in mind for business owners who want to build funnels to launch digital products and host their courses and products on their platform. That’s why I recommend holding off investing in Kartra until you’ve got an engaged email list. Because you don’t need all the bells and whistles Kartra offers to accomplish this. You simply need an email marketing software to grow your email subscribers, create email sequences and newsletters to nurture your email list. Once you’ve got an engaged audience of 2,500 subscribers that you’re nurturing regularly, you’re in a stronger position to launch your digital products. Next, you’ll need to create a game plan for how you’re going to launch your digital products so you can figure out what features you need to achieve this. Only when you need features, such as webinars, sales funnels, checkout features and membership platforms should you consider Kartra. What do you think of Kartra? Is it the right tool for your business? As always, what was your biggest takeaway from this blog post?